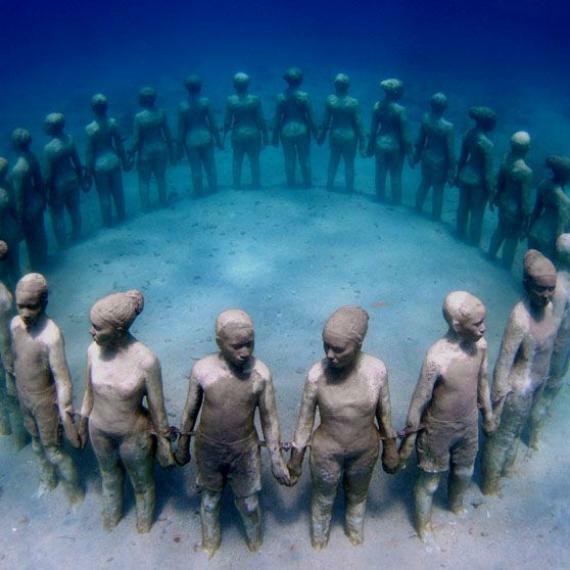 Artist Jason deCaires Taylor foregoes traditional art display with his underwater museum which can be found off the coast of Cancun, Mexico. Taylor, who grew up with an appreciation for the ocean and marine life, combines his passions of diving, underwater photography, and sculpture with the phenomenal project that is home to over 450 public sculptural pieces. The most exciting part of his project, Taylor says, is documenting his many sculptures and the evolving effects the ocean has had on them over the years, and the way they become one with the ocean as his sculptures turn into actual coral reefs over time.